The best multifunction products go beyond output efficiency to become key components for enhancing business processes and managing valuable enterprise information. The latest generation of “smart” MFPs (SMFPs) is taking efficiency a step further. These units use prebuilt connections toleading enterprise applications and give IT administrators options for easily adding advanced features over time. The result: SMFPs are becoming onramps to larger information ecosystems that enable enterprises to replace paper with electronic documents and optimize business processes throughout their organizations. 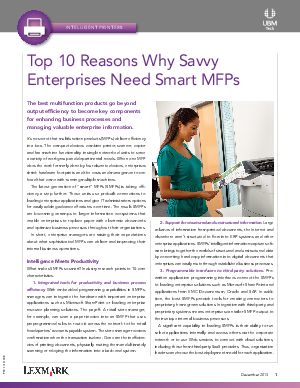 Download this paper to read the top 10 reasons savvy enterprises need smart MFPs.